Terri Guillemets, a resident of Phoenix, Arizona is a quotation anthologist who started collecting quotes when she was just thirteen. Sharing literary, thought-provoking, inspirational and humorous quotations with the audience throughout the world through her web portal “The Quote Garden” is her passion. Her website is the most established collection of online quotations which also offers an array of topics for the special occasion. 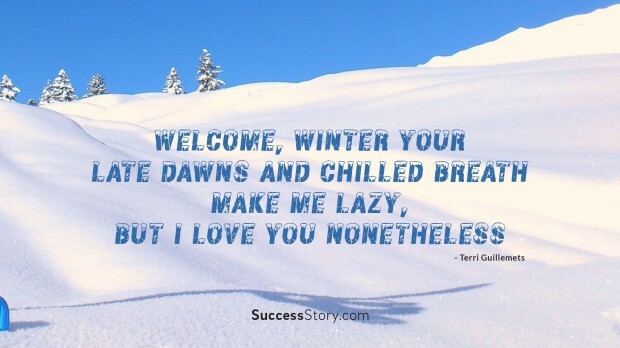 "Welcome, winter your late dawns and chilled breath make me lazy, but I love you nonetheless"
She is a specialist in revitalizing vintage quotes and writings from the 17th century. She shares the art of writing, love of old books, and the beauty of words with a special, whole-hearted approach. She is a curmudgeon-esque optimist whose soul of a child will never grow up, she also enjoys nature, cloud-gazing, photography, and family. As per Terri, the greatest wish of her life has been satisfied, and now she want to boast of a “Garden Room” of her own, a place where working is a retreat. A place holding a lot of old books, with mildewed covers, and time-worn pages. Terri simply loves the expressions and words of the good old day’s writers. She has spent a lot of time in looking and searching among books that are rare even rarest of the rare, and not easily interpreted or read, for those who have no inclination or time to search. She always tries to reveal hidden pleasures and buried joys. For her study she has learnt much, she defines it as a labor of love, and she shares it with the world with happiness.